Aaron Crow is a pitcher for the University of Missouri who has been getting a lot of attention lately due to a string of strong performances. I recently came across a fairly glowing analysis of Aaron Crow's pitching mechanics at Saberscouting.com that I strongly disagree with. Let me explain why I think this analysis is seriously flawed. In the analysis, when examining Aaron Crow's arm action, the writer focuses on the wrap (or hook) in Aaron Crow's wrist and what he thinks the consequences of that will be. Basically, Crow is firing the muscles from his elbow to his wrist when he’s not supposed to be, to create this cocking of the wrist. That might not sound like a big deal, but using more muscles than you need to not only outputs less power (relaxed muscles more powerful than firing ones, hence preferred effortless mechanics) but is stressing that area of the arm. It stresses the arm because you want as little wasted motion and muscle use as possible, and this makes an unnatural motion have more effort in it—like pitchers aren’t injured enough. So what are the side effects of this type of move? Elbow soreness and eventually, most likely, Tommy John surgery. While the above sounds good, the truth is that it makes no sense anatomically or physiologically. A hooked wrist can certainly cause control problems due to the tension it creates in the wrist, but it is unlikely to cause elbow problems. First, a pitcher's primary source of power is the muscles of their core, not their arm. While tensing up the muscles of the forearm might impact a pitcher's control, it will not have an appreciable impact on a pitcher's velocity because those muscles don't create much, if any, velocity. Second, as the name implies, the Ulnar Collateral Ligament (or UCL) is a ligament, not a muscle. When you hook your wrist, it has little impact on the structure of the elbow, and no impact on the UCL. What matters when it comes to the health of the UCL is the torque that is applied to the elbow as the shoulders rotate and the Pitching Arm Side (PAS) forearm is still vertical. The person who wrote the analysis of Aaron Crow for Saberscouting.com apparently belongs to a school of thought, led by Paul Nyman of Setpro.com, that extols the virtues of arm action and scapular loading. As for the rest of the arm action: Well, it’s just great. Aggressive, no pauses (just slows down a bit with the wrap), elbow picks up the ball, high torque, good scap load, all the elements are there. So, the conventional wisdom is that Crow has an okay delivery, clean arm action. I would say great delivery, okay arm action. It’s more a semantic difference, but I wanted to clarify. What that means 20-80 scale with is that he’s great arm action with a red flag, still a little better than a totally clean arm with no aggression, as he may never get hurt and it works for him. Call it 55. The problem is that they don't understand that, as I point out in my article on Scapular Loading, there appears to be a safe way to scap load and an unsafe way to scap load. As I explain in my article on scapular loading, the safe way to scap load is to follow the example of Greg Maddux and keep the elbows below the level of the shoulders like this. 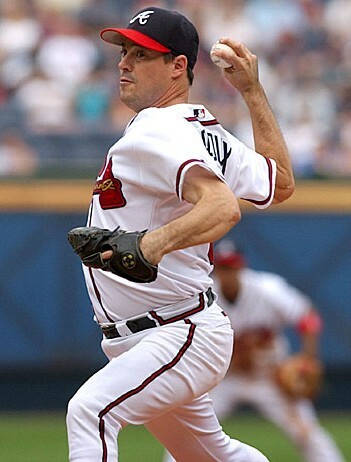 Aaron Crow's arm action is quite different than Greg Maddux's. As the author explains, Aaron Crow breaks his hands with his elbows and lets his elbows pick up the ball. You can see this in the clip below. Notice how high Aaron Crow's PAS elbow gets in Frame 1 and then stays in Frame 2 and Frame 3 of the clip above. You can see the same thing in the clip above of Aaron Crow. Notice how high Aaron Crow's PAS elbow gets in Frames 17 through 20. His PAS arm passes through a classic Inverted W position. First, it increases the strain on Aaron Crow's shoulder because his PAS upper arm is rapidly externally rotating while his PAS elbow is still quite high. This can lead to an impingement injury. Second, it affects Aaron Crow's Timing and makes his arm late. This increases the load on both his shoulder and his elbow. All of this makes Aaron Crow a risky proposition for the team that picks him in the 2008 draft. I'm listening to the MLB draft and heard two things mentioned about Aaron Crow. First, an analyst just came on and talked about how scouts are focused on the hook in Aaron Crow's wrist as his major mechanical red flag. I believe that people's focus on Aaron Crow's hooked wrist reflects an unfortunately common lack of understanding of pitching mechanics. Aaron Crow's main problem is his significant Inverted W, and the negative impact it has on his Timing, not the hook in his wrist. Second, I just heard it mentioned that Aaron Crow has a good slider. As you know, I hate the slider and think it is very bad for the elbow due to the high-speed supination. Combine that with his Inverted W and I wonder how long his elbow (and ultimately his shoulder) will hold up.